In feudal Japan, Kaede Hajime lives as a vagabond ronin, a samurai without a lord. As he spends the night at a village's inn, the innkeeper begs him to help stop a mischevious kitsune, a fox spirit, plaguing their village. But when he captures the spirit—in the form of a hauntingly beautiful man—Hajime learns that the kitsune has troubles of his own. The pearl that contains the fox's soul has been stolen, leaving him a slave to the new owner, who is forcing him to attack the village. Hajime was fast. He jumped, grasping the copper rain chain hanging from the nearest house and reaching up to grasp the edge of the slanted roof. He hauled himself up, the chain clinking wildly below him, and sprinted. The village's roofs were nearly level, but still slanted enough to make running on them dangerous—Hajime nearly lost his footing twice and cursed. He might survive the fall, but he'd surely break bones, and his chase would be in vain. He leapt between the close houses, struggling to retain his balance. The fox was some ten yards ahead, small and fast, taking impossible leaps and all but flying across the roofs, its balance perfect and a fan of tails fluttering behind it. Hajime abandoned all caution, leaping across a wide road, suspended in the air for a long, exhilarating instant where he wondered whether he'd make it to the other side or plummet to the ground. He landed heavily on the very edge of the roof, wobbling backward for a dreadful moment, but was quick to regain his balance and sprint again. For all his prowess, Hajime was losing ground. The little fox had reached the last houses of the village, and it jumped easily off the buildings, diving for the forest. Hajime ran, the chase making him careless and only luck preventing him from falling when he dared jumps too broad for him. 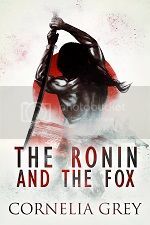 He followed the fox down, bending his knees to absorb as he landed on the ground the impact, and scanned the bamboo frantically, trying to guess which direction his prey had gone. A loud, pained yelp tore the night, and Hajime sprang up, unable to contain a wild grin. The fox must have fallen into one of his traps. He launched himself between the clumps of bamboo, following the whimpers and yelps, and only slowed down when he saw the small shape of the creature twisting fruitlessly, one of its hind legs caught in the jaws of a trap. As he approached, the figure shifted and blurred, stretching and growing, making Hajime's eyes ache until he had to look away. When he glanced back, Hajime could see a human where the fox had been, bending to pry the trap open with frantic hands. "Not so fast," Hajime growled, his hand shooting out to grasp the man's arm. Before the fox spirit could react, Hajime tied a red ribbon like the one he was wearing around the man's wrist, knotting it maybe too tight. The man cried out as the fabric touched his skin, trying to tear his arm out of Hajime's hold. When the fox spirit turned around to face him, Hajime gasped. The man had wild red hair and two furry fox ears flattened over his head like those of an angry cat. His face was contorted in agony and anger, covered in scratches and with a large bruise marring his cheekbone, but there was no mistaking his delicate features or the unusual, rust-brown eyes that fixed on Hajime with fury, and which had been full of pleasure the last time he'd seen them. "You," he gasped, his grip on the stranger's arm faltering. The fox snatched his wrist out of Hajime's hold and snarled, his head held high. "Surprise," he said, sharp teeth gleaming in the moonlight.